H&C Food Inc of Brooklyn, NY is recalling the Frozen Fuzhou Fish Balls and the Fish Balls, because they may contain undeclared wheat, pork, egg, and crustacean. People who have an allergy or severe sensitivity to wheat, pork, egg and crustacean run the risk of serious or life-threatening allergic reaction if they consume these products. The Fuzhou Fish Balls and the Fish Balls was distributed to supermarkets in Queens, NY and reached consumers mainly through the retail stores. The recalling Frozen Fish Balls came with two different packages. First, the frozen fish balls are in the red and white plastic bag with gold and black font that are written Fish Balls and the size for this is NET WT: 14OZ (400g), UPC: 6 953006 4 50093. The Fuzhou Fish Balls are in the blue and white plastic bag with gold and white font that are written Fuzhou Fish Balls and there are two sizes: Net WT: 14 OZ (400g), UPC: 6 953640 050017 and Net WT:4.5 lbs. (2043g), UPC: 6 953640 05000. These Frozen Fish Balls don’t have the expiration date or lot code on the package, however, they can last for 18 months. There are no illnesses have been reported to date. The recall was initiated after it was discovered that product containing wheat, pork, egg and crustacean were distributed in packaging that did not reveal the presence of egg and crustacean. Subsequent investigation indicates the problem was caused by a temporary breakdown in the company's production and packaging processes. 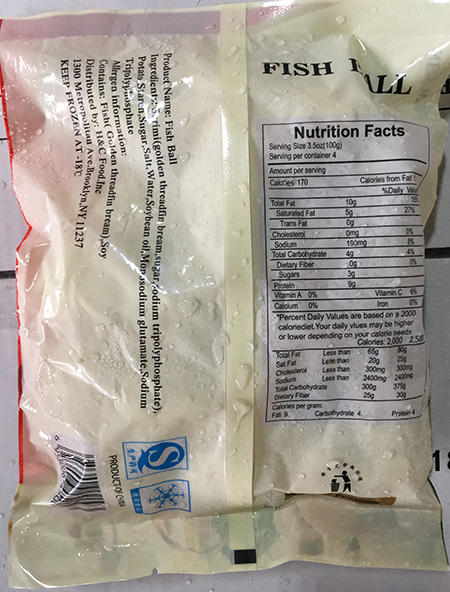 Consumers who have purchased frozen fish balls are urged to return it to the place of purchase for a full refund.